Bundesliga | How will Bayern Munich line up under Jupp Heynckes? Jupp Heynckes has won eight major trophies in three previous spells with Bayern Munich. Will more follow this season? 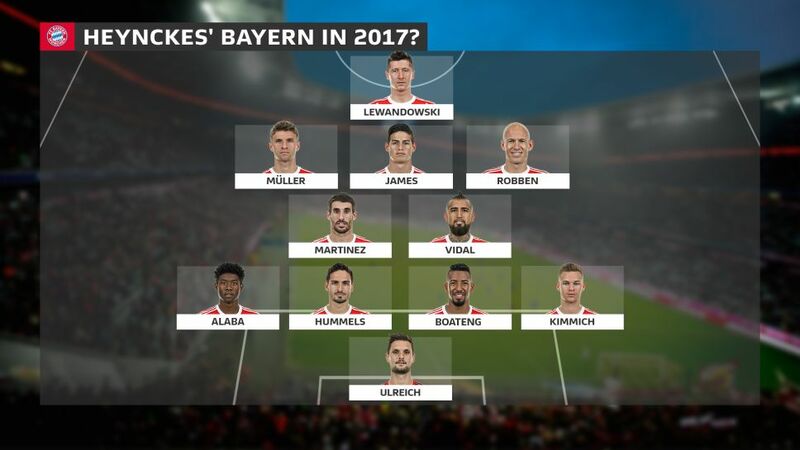 How will Bayern Munich line up under Jupp Heynckes? Jupp Heynckes has returned as coach of Bayern Munich, replacing Carlo Ancelotti at least until the end of the season. The 72-year-old knows a thing or two about bringing trophies back to Bavaria, having won the treble of Bundesliga, DFB Cup and UEFA Champions League in 2013… but how will his Bayern of 2017 line up? Heynckes’ Bayern in his most recent stint as coach was arguably one of the strongest squads ever assembled at the Allianz Arena. Bastian Schweinsteiger and Philipp Lahm were still in their primes; Toni Kroos was yet to defect to Real Madrid; and alongside Manuel Neuer, Jerome Boateng and Thomas Müller, the Bayern of 2013 boasted six players who started – and won – the 2014 FIFA World Cup final against Argentina in Brazil the season after Heynckes’ last departure. A feature of that Germany side was also a stand-out from Bayern’s – both played with a double pivot, meaning two players were expected to anchor the midfield rather than one. Heynckes signed Javi Martinez from Athletic Bilbao to that end in 2012 – it wasn’t until a February 2014 injury crisis that the Spaniard was tried out as a centre-back in the Bundesliga, under Pep Guardiola. Perhaps the most famous goal that season was scored by Arjen Robben, though, the Dutch wing wizard who poked past Roman Weidenfeller in the all-German Champions League final against Borussia Dortmund in London a minute from time to give the Bavarians their fifth European crown. Injuries restricted Robben to just 11 Bundesliga starts that term, however, where Ribery and Müller enjoyed 24 and 25 respectively. Granted Kroos, Schweinsteiger, Mandzukic and Dante have since moved on, while Lahm called time on a career which took in 22 major trophies last summer. The four players in the above 2013 Bayern line-up who also feature in the 2017 incarnation could so easily have been six, though, had injuries not curtailed Ribery’s and Neuer’s seasons. Neuer remains the world’s best goalkeeper, however, and will reclaim his place in the new year. Ribery’s pain looks set to be Robben’s gain, in a role reversal from four years ago. From there it’s a case of plugging in the most similar players. Arturo Vidal is as complete a midfielder now as Schweinsteiger was before him; Müller can just as easily drift in from the left as the right; whilst there’s a fair chance Martinez is the happiest man in Bavaria right now. The big question lies at No10. James Rodriguez or Thiago, Thiago or James: decisions, decisions, and one Heynckes may just have had made for him with Thiago joining Ribery and Neuer on the sidelines with an injury of his own.